You've got the bug. 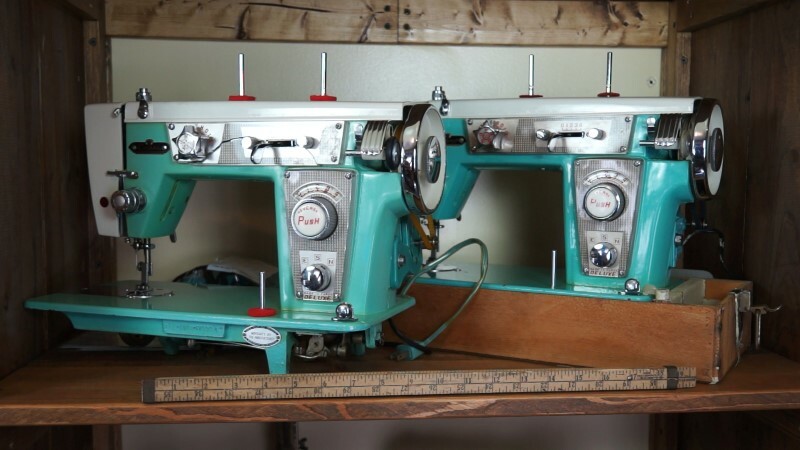 Every vintage sewing machine (VSM) tugs at your heart strings and every orphaned machine must be preserved. But slow down a moment, let's talk about this. And don't worry - this isn't a full-blown intervention. Above photo: Will McCann, collector, and Brenda Wolfensberger, co-producer, discuss colorful Japanese models in the documentary film Still Stitching. What you call a "collection," others call a "hoard." You've been sneaking machines into the house when your spouse isn't home. You bought your vehicle based on how many cabinets will fit into it all at once. You frequently awaken from nightmares in which every VSM ad on Marketplace and Craigslist has only blurry photos of the back of the machine. 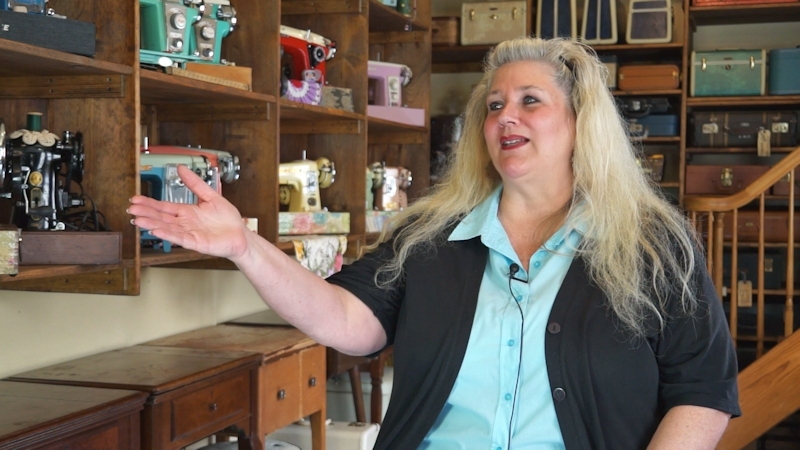 Preserving vintage sewing machines is a noble pursuit. Modern consumers are resigned to the fact that so many technical devices feature "built-in obsolescence," and heirloom-quality VSMs can seem impractical to the unenlightened in our always slimmer, always faster, always "smarter" world. Plenty of VSMs need rescuing before they land on the proverbial scrap heap. However, it's also true that many machines being purchased aren't being rescued, they are simply being bought before someone else buys them. The line between temptation and opportunity is often not merely blurred, it vanishes entirely among VSM enthusiasts. An inner restlessness ensues that won't allow us to idly watch that one get away. Or that one. Or that one. The rules of at least one Facebook group essentially insist, "Stop asking if you should buy it - just buy it." At least we're self-aware in the VSM community. We know we are enablers and we know we can be excessive. We often wear it proudly, do we not? Some of the Still Stitching collection. 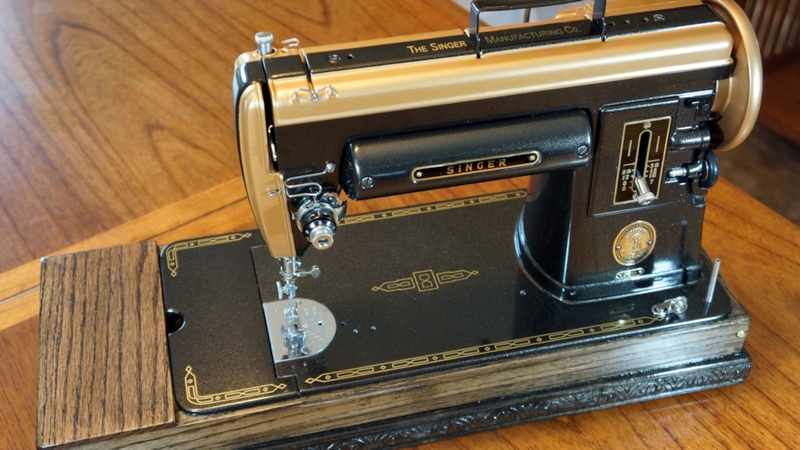 It isn't difficult to articulate just what makes us starry-eyed for vintage sewing machines. Function - VSMs work amazingly well. Reliably. Powerfully. 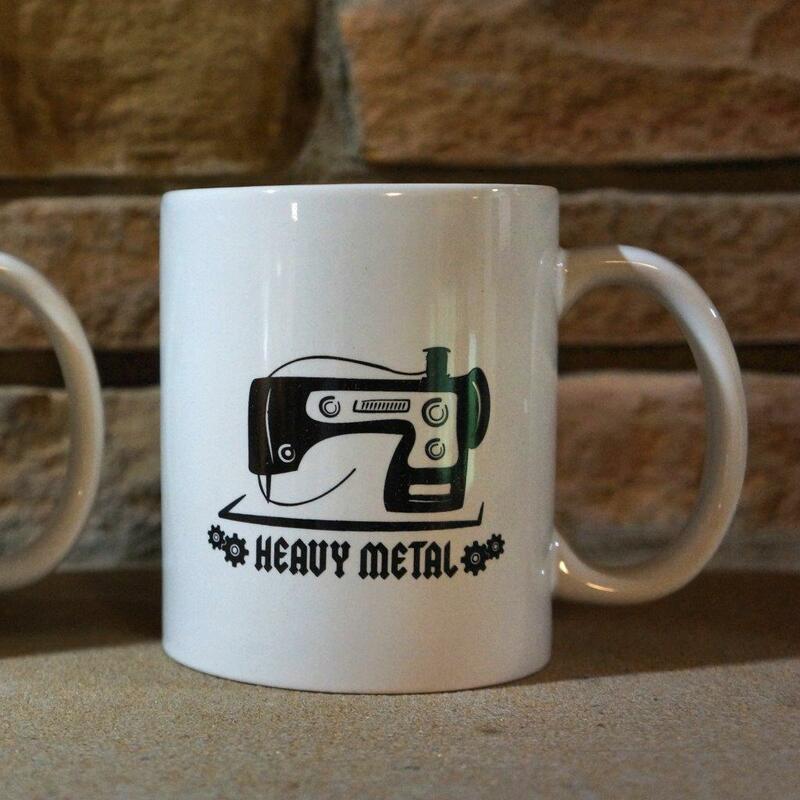 Design - Most are beautiful, and any all-metal machine deemed "ugly" by one collector will be passionately defended by another. History - Brilliant inventors, marketers, liars and thieves; the thrill of victory and the agony of defeat. 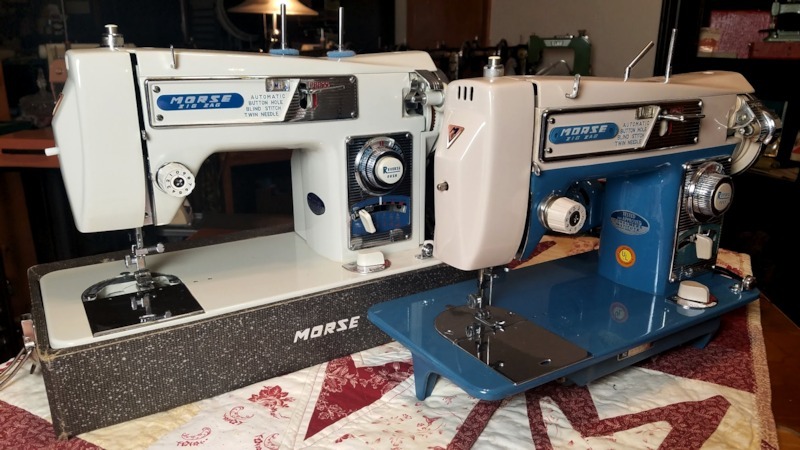 From Madersperger and Thimonnier to the final demise of the Clydebank Singer factory in the 1970s, sewing machine history is one heck of a rabbit hole at 2:00 a.m.
Not least of all, collecting VSMs en masse offers low barriers of entry. Price is shamelessly at the core of incessant if not haphazard collecting. 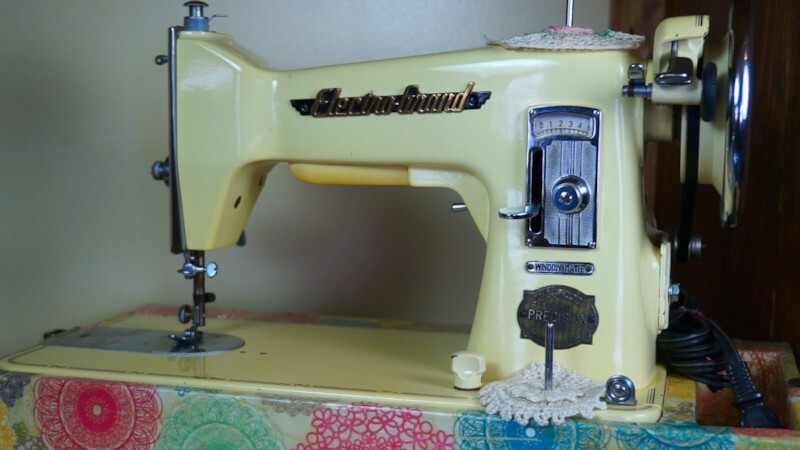 Generally speaking, vintage sewing machines are cheap and highly accessible. In further terms of an accessible pleasure, the newly indoctrinated often gain rapid technical comprehension. 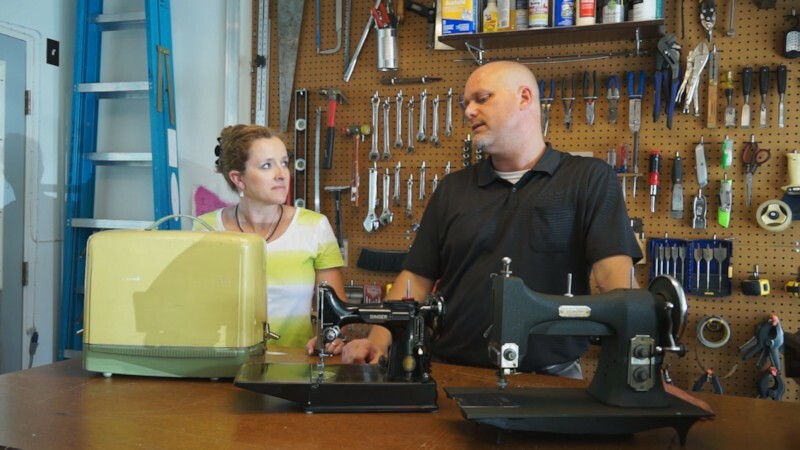 While few of us could engineer a sewing machine from scratch, they aren't terribly difficult to understand, maintain, and repair. With some aptitude and willingness to tinker, hands-on proficiency can follow quickly. The essential tools required to perform maintenance will fit into a small tool box and still rattle around. Even the more technically challenging tasks are well explained and demonstrated in abundant YouTube videos. Repairs of an increasingly technical nature mark our journey and give us little victories as we advance our skills. For those reasons and probably more, it's very common for a newbie's interest to surge, accelerate, and hit top speed before you can say, "Sheesh, how many machines have you bought already?" It's easy to understand why a particularly zealous acquisition phase is so common, perhaps even a rite of passage, but there might be a better way to start your collection. There are indeed rare antique sewing machines of considerable monetary value due to their historical value and low numbers. 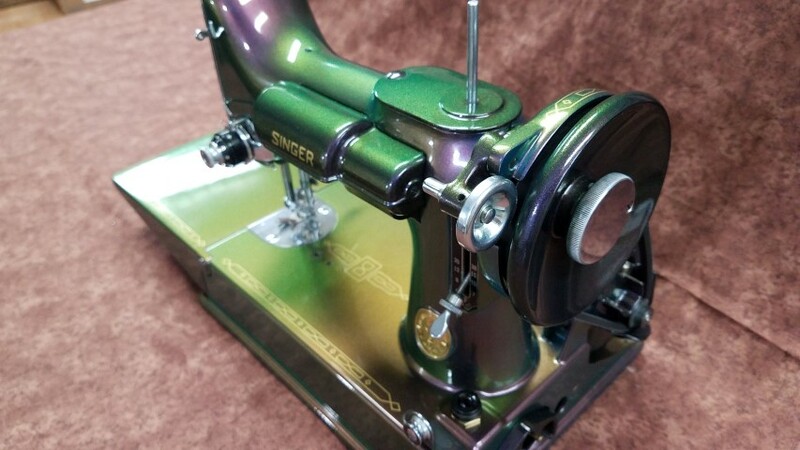 There are also particular models of Singer 221/222 Featherweights and other non-antique machines that are scarce, sometimes rare, and in high demand. There are machines which will command value whether people actually sew or not; and that's an important consideration. 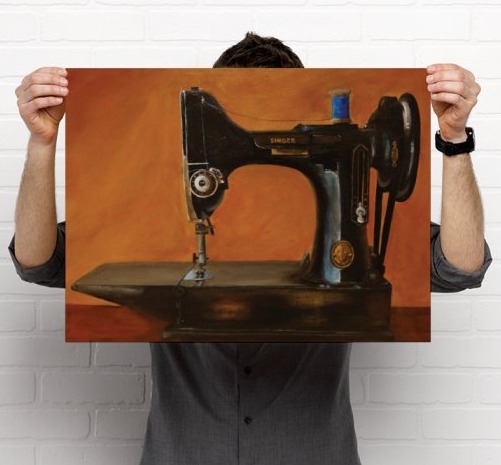 When thinking of the potential value of machines that are in reality quite abundant, if there are fewer people sewing in the coming years there will be less interest in the machines themselves. This whole VSM thing could "peak," but when? 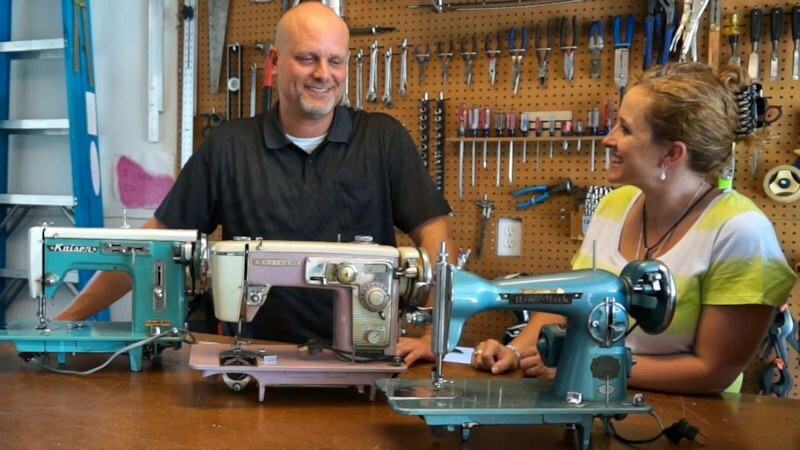 Some qualified observers have reported renewed interest in sewing tied to a cultural trend rather than a necessity, as a do-it-yourself spirit has surged in recent years. It has been tied to the hipster generation candidly - thanks to YouTube tutorials and a pervading notion that "vintage" equals "authentic," and companies like Butterick and Vogue have reissued vintage clothing patterns in response. 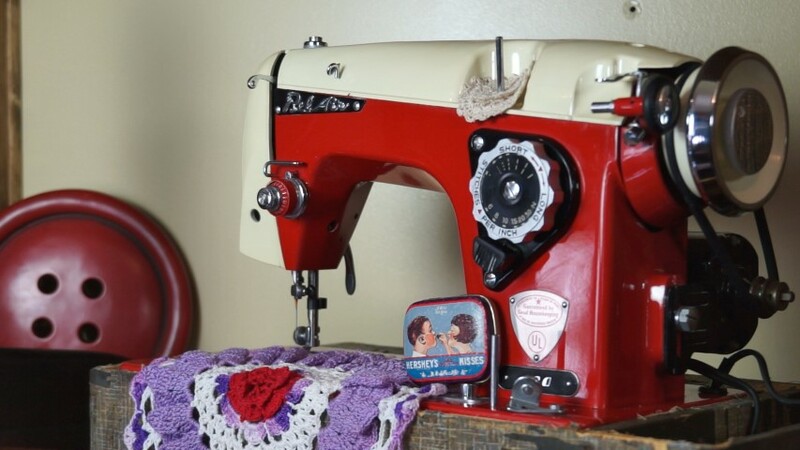 Like any cultural trend, it's likely this one will subside, and this trend is very unlike the circumstances that led to the Golden Age of Sewing before the 1970s, when necessity and time-honored domestic skills drove the prevalence of sewing. 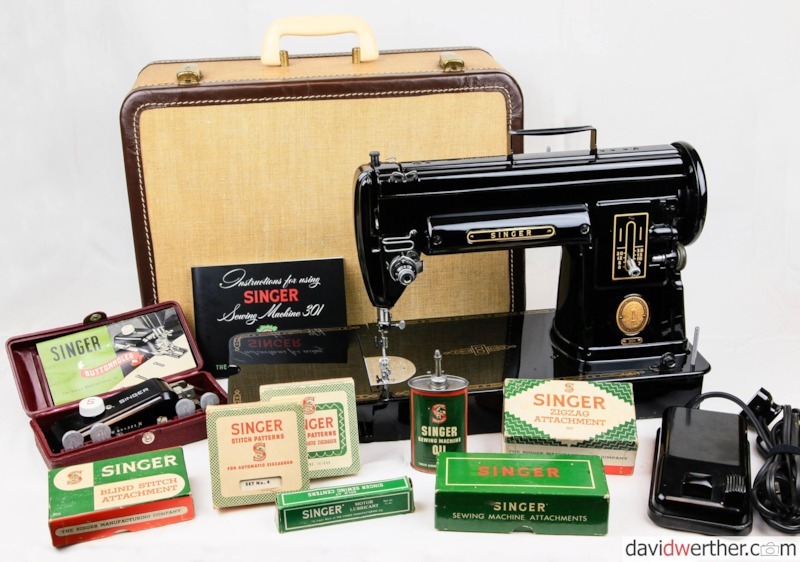 While sewing machines from that Golden Age worth perhaps even a few hundred dollars (like the Featherweight) can still be stumbled upon at bargain prices, it is increasingly uncommon to do so thanks to the Internet - potential sellers are well informed. Any major "steals" must occur outside of the informed seller's marketplace. 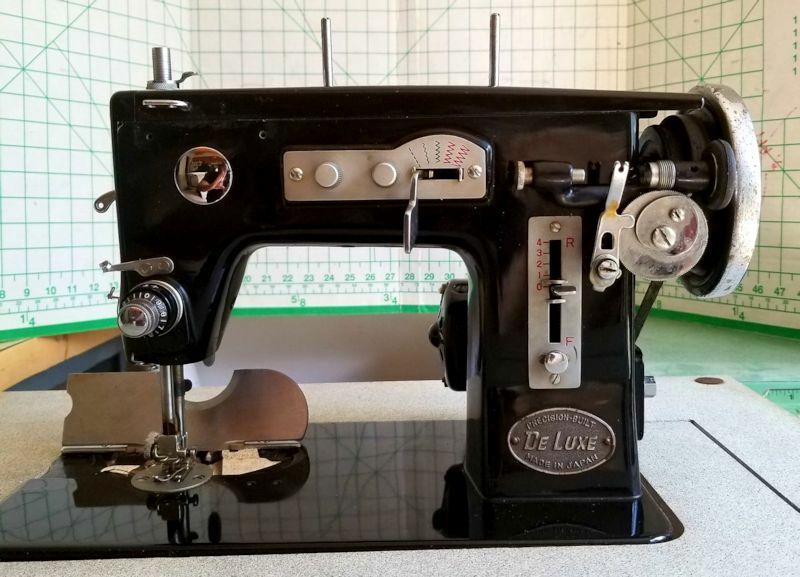 We meanwhile are mainly discussing that sea of vintage sewing machines that we all know readily exist - those abundant machines that can be found searching Craigslist, Facebook Marketplace, Goodwill stores, auctions, and the like; the machines we find when we pop into the thrift stores, hoping for a gem. It will be generally understood that VSMs are not compelling as a formal investment, but even at lower dollar amounts, it cannot be disputed that a 200% or greater return in a short amount of time is nothing to shake a stick at. This is why many do purchase machines to "flip." If you've observed a particular model selling consistently at $50 and you know where to grab one at $25, the math is pretty easy. In short, flipping machines in the near-term can make sense, but that isn't collecting, is it? I don't think the future is all that rosy for vintage machines in general. 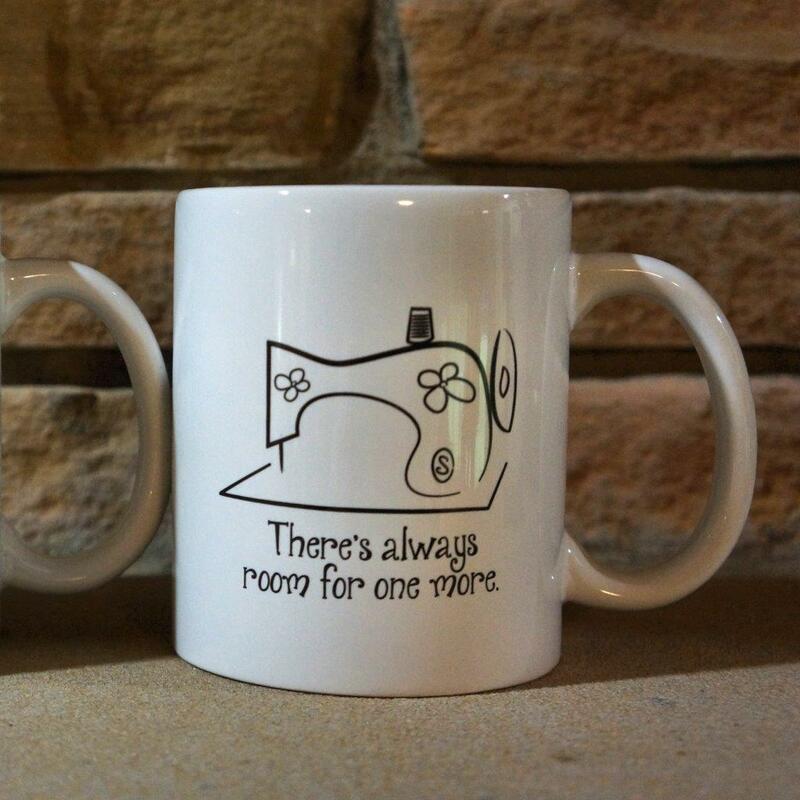 [Fewer] people sewing means that fewer people will own machines. Fewer people own them, but those who do, own more than one. Fortunately the market is brisk right now for people collecting machines, but I see a change coming and it is not for the better. This is informed speculation, admittedly, but it should be considered if a new collector is on the verge of leaping into VSMs as an "investment," enamored by the fact that they are so beautiful, inexpensive, and there is such an excited community dedicated to them. All this excitement doesn't mean they will someday be worth a lot more than they are today. Regarding Featherweights, note that they are most popular among quilters. 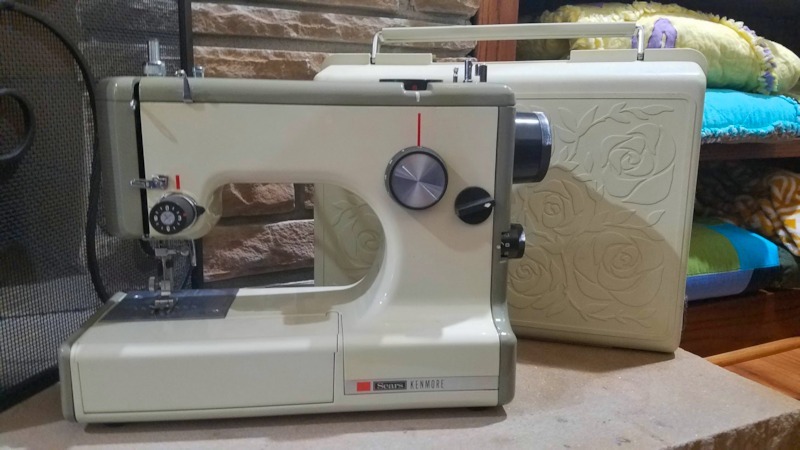 While it's true that new blood continues to infuse a multi-billion dollar quilting industry, Featherweights have a special appeal for their portability, but the larger majority of vintage machines are beasts to lug around and are better suited to a sewing room. The average length of time that a respondent had been a VSM enthusiast was 9.6 years. Nearly half of respondents had been interested in VSMs for fewer than 5 years. 26% indicated that they had been enthusiasts for 10 years or more. 19% indicate that they have been VSM enthusiasts for 20 years or more. Those figures suggest a longevity among collectors, but if we don't continue to teach and encourage younger generations to sew beyond mere trends, the value of VSMs could even drop. A final point from the 2016 survey: about 75% of collectors expected to have a completed collection of no more than twenty machines, and more than 50% of collectors expected no more than ten. With all this information in mind, it might seem to cut our discussion short in terms of how to collect wisely. But while the general advice of "buy what you like at the price that feels right" is an indisputable bottom line, there are still things a new collector can consider. If you're embarking on this journey, a little foresight could mean that your collection will more likely retain if not gain value so that someday when your progeny has no remaining interest in the machines, they might find that they are at least worth a few semesters of college text books, or several fine meals, and aren't just a godawful heavy nuisance to haul out of the house. With a little care and insight, there are much worse items you could choose as an investment (which can have little to do with what feeds your soul). Will McCann discusses the Featherweight craze, risking bodily harm from the Featherweight Mafia when he suggests that there could be more sensible options. "Some people just acquire like a nut," says collector and restorer Will McCann, admitting, "I did some of that at first. That's how I have no use for a 1965 Singer 328 yet have two of them. But after a while, when you recover your senses and want to be discerning, people say, 'If you don't take this, I'm scrapping it,' and you go, 'okay...'" - and you can't possibly say no. That's a good point from Will. Let's not bother with any analysis of accepting free and at-risk machines. I mean come on, what sort of lunatic refuses a free vintage sewing machine? Preposterous! Just check my garage, you'll see. Among other questionable adoptees, I've been lugging a heavy Kenmore 95 in its cabinet back and forth every time I reorganize my workspace for two years now. It's like dragging a corpse around, all to preserve a machine too ugly for the Addams Family's cellar. Oops, allow me to correct myself: too ugly in my opinion. A lavish buying phase is often followed by a slow realization that it's time to "thin the herd." The problem with thinning the herd is that these old machines are heavy and inconvenient and take up room when we've gone off the rails, and now we have to move them around some more?!? It's important to know that while many dedicated folks have had some success selling machines, the wrong machines won't sell easily for any significant profit, particularly if you accept that your time and effort has value - and some, like my Kenmore 95, can be difficult to give away. Seek mindfulness in your collecting. By clarifying your purpose as you seek vintage machines, you'll find the patience to obtain machines that fulfill your true desire, need, or both. Whether you buy two or two hundred, acquire machines that matter to you beyond a mere obsession. "In the beginning, I did accumulate machines rather recklessly," fashion designer Victor Hou tells us, but he figured out a better way. Before I knew it, I was at well over one hundred machines. Tinkering with so many different ones, I started becoming familiar with the inner workings, and how machines operate and function. One of the main issues was accumulating machines faster than I had time to work on and maintain them. Hosting Ray Elkins's workshop gave me a lot of insight. Being in over forty Facebook VSM groups taught me a lot, as well as gave me some insight as to what machines were the most sought-after. Victor landed on his feet because he saw the potential for "flipping" machines and had an end-game in mind. But where his early purchases may have been "reckless" as he said, he's now very selective. He also sells parts from a large inventory he purchased. If you have accumulated a lot of machines with little forethought or without a clear purpose, you can right the ship. Catalog your machines. This really can matter because even a dozen machines can become hard to juggle in your memory bank without a review. A small notebook will work, or a spreadsheet, to record brand, model, color, features, where purchased, price paid, any anecdotes or information on previous owners and the life of the machine, and any production data you've found for the model. How many machines are ideal for your space? It's healthy to decide your limit, and it makes future plans and decisions easier. Identify your "keepers." Challenge yourself to determine the machines you don't want to let go, and any you should, will, or might rehome. Mark your catalog entries appropriately. Determine the typical selling price of all your machines that you are willing to sell. Check local Marketplace and Craigslist listings for a general view of the typical asking price for a given machine. Check eBay for the model and ignore the "Buy it Now" prices for the most part. Specifically view the Sold and Completed listings to see the actual final selling prices. Compare your machines to the ones selling elsewhere in terms of condition and included items. When listing a machine for sale, include abundant clear photos of the machine, case/cabinet, and all accessories. 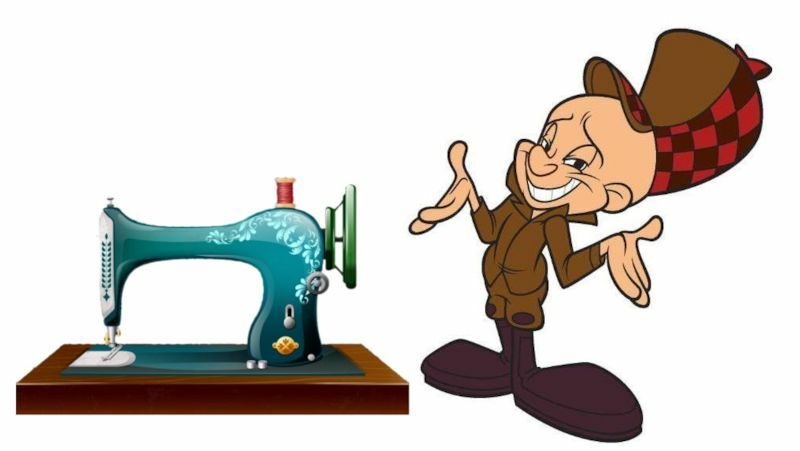 Provide a detailed description and if the machine does sew properly, indicate that it is ready to sew. Tally the funds you hope to collect by selling some machines, then decide how to go forward. The potential funds, once materialized, might be your budget as you start acquiring machines more deliberately and more selectively. Spread good will. 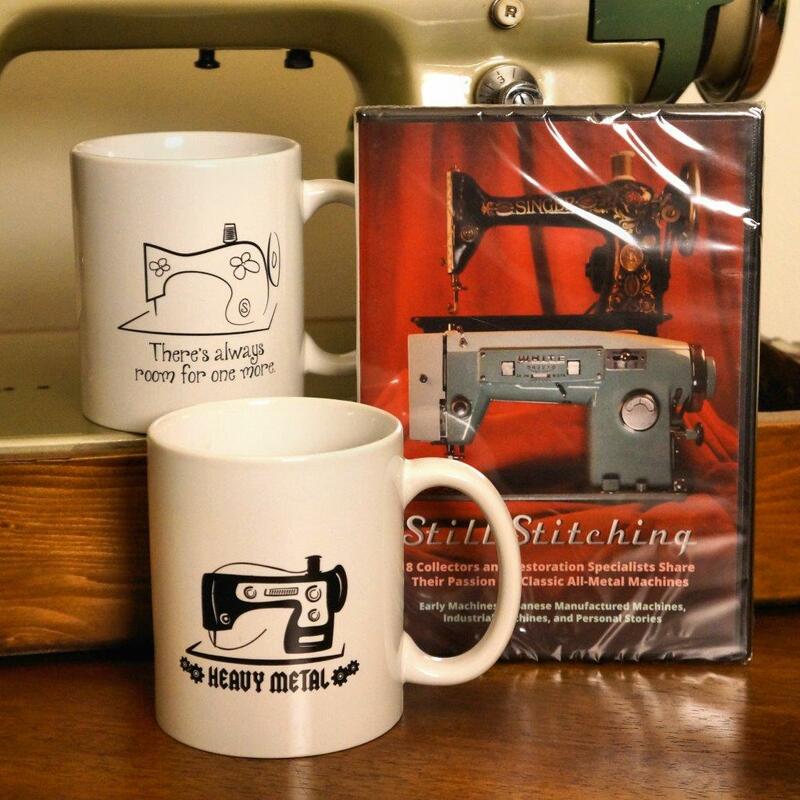 Consider gifting a machine to a friend who doesn't yet sew, and offer to teach them some basic sewing. To do this for a child or young adult could especially change their life. 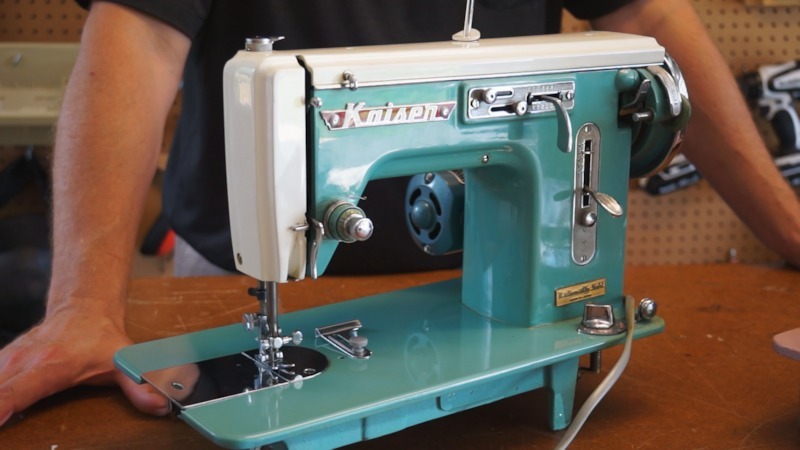 If you know of an adult who fondly recalls that they "used to sew," encourage them to return to sewing with your help and a wonderful vintage machine that you're giving away. When using eBay to help determine the typical price of a particular machine model, filter down to the "Sold listings" to see the actual prices achieved. This is more accurate than basing prices on the "Buy it Now" offerings. "I would advise not to buy every piece you can," says Niels de Gooijer. 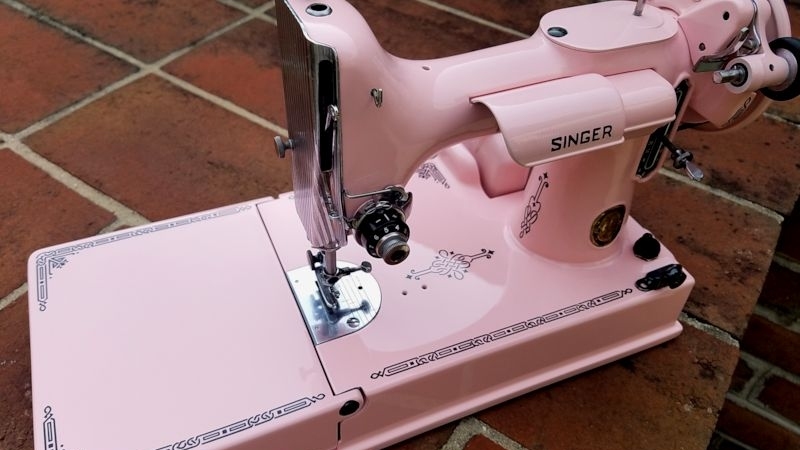 "What gives me most satisfaction is when I can buy a sewing machine complete with case and accessories in very good condition at a fair price. Sometimes you will have to wait a bit longer, but it will be worth the while." While packages this complete may be fairly rare, to find a machine "in full dress" will provide a new level of satisfaction for the determined collector. Image: David Werther | Quilters-Connection.com. I came across a Kenmore 54 once - arguably the most beautiful Kenmore ever made - in near pristine condition. It had everything. The manual looked like it hadn't ever been thumbed through. Complete set of E cams. The accessories were all in their original boxes, with the tissue paper. That's fun. It's like Christmas morning. I think about that a lot, actually. These machines were not inexpensive items. A lot of these machines, in modern money, sold for around $2500 or so. If a woman had one under the tree on Christmas morning... that was a really big deal for people. They were likely making monthly payments to purchase them. And so many of those women are no longer with us. So it's like having a piece of them, some evidence of their life, live on. I have a very palpable sense of that when I'm working on a machine; that this was incredibly special to someone once. She might have made clothes for her kids with it, or Halloween costumes, or whatnot. It was a part of people's lives then in a way they typically aren't today. 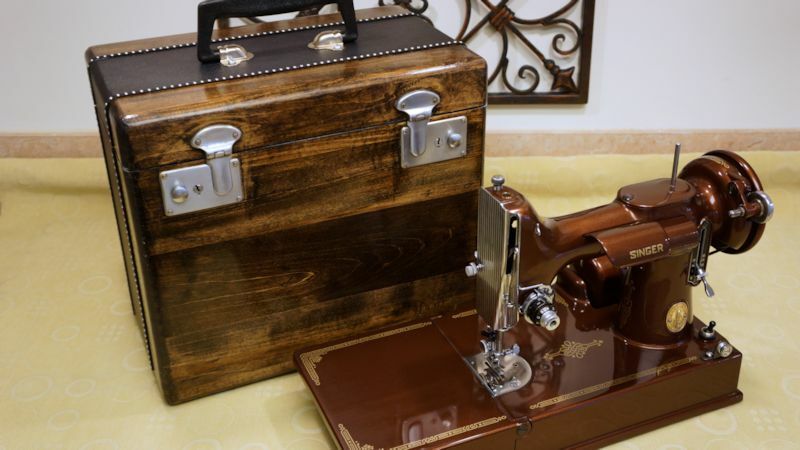 Early in your journey, do your best to plan and budget for at least one complete and rather pristine package, the machine "in full dress" with the case or cabinet as preferred, the manual and basic accessories all together, sharing the same thread of time and quietly telling a story. Make such an acquisition a goal so that as you search for machines, you might avoid blitz-spending $300 on ten average machines and instead snag a dream machine or two over time. 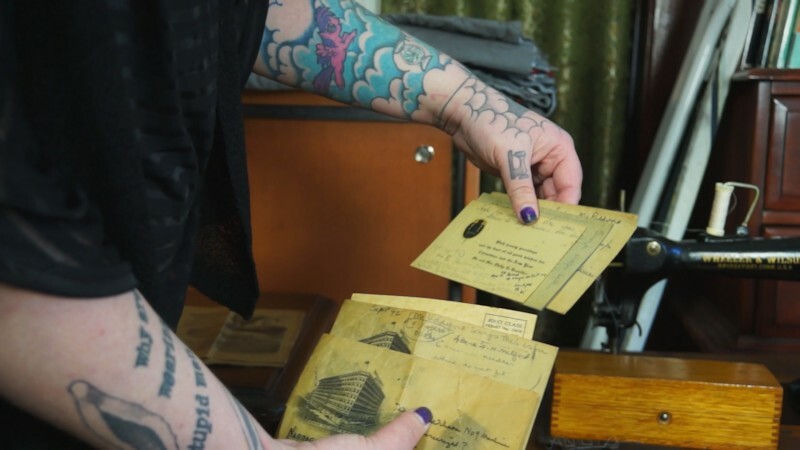 A tangible bonus is when the package includes ephemera - receipts, leaflets, hand-written notes - or trinkets left in case pockets and cabinet drawers that connect the machine very deliberately to its past. With a plan, you can avoid distracting temptations. Danna L. Fore displays letters that accompanied her Wheeler & Wilson IX. We've discussed the "cheap" element of collecting VSMs, and it's true that the value of determining temptation versus opportunity may seem less important at lower prices. 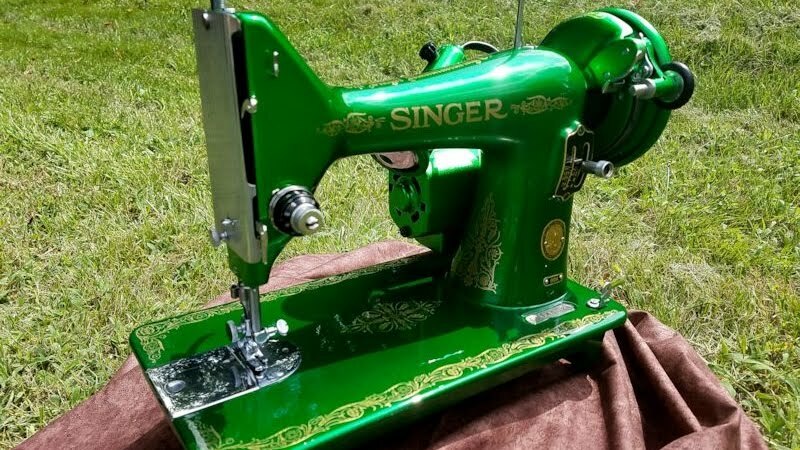 Think of a $20 common model that is neither rare nor particularly special in any way yet still pretty and functional, as opposed to a stunning less-common machine, perhaps a Singer 66 Lotus in a gorgeous cabinet with all accessories, available for $460, gleaming and ready to sew. (Our example is a U.S. scenario.) Let's also presume that it's one of your "dream machines" and you never expected to find one so complete. 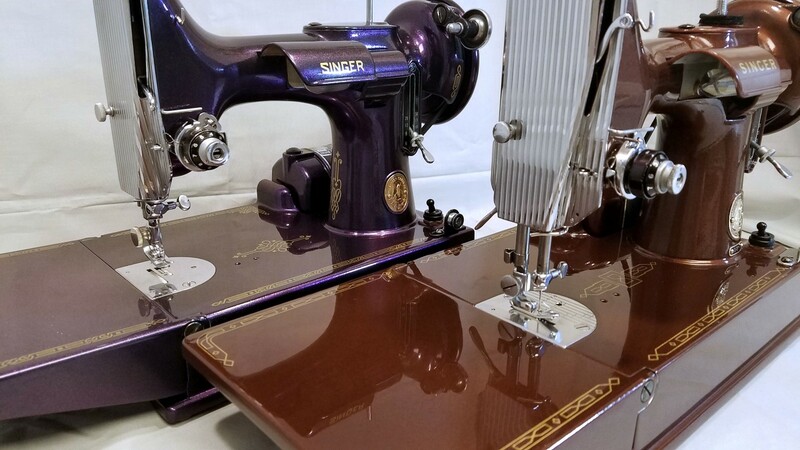 The lotus decals on a Singer 66 might be worth the wait and a larger price. A $20 temptation. A $460 opportunity. Sounds backwards, but it isn't. There is a clear distinction, given the relative scarcity of the Lotus in the U.S. and the quality of the package. The myriad of scenarios begging the question temptation or opportunity? can be debated endlessly, but it should go without saying that every short-lived thrill or marginally satisfying $20 purchase is twenty bucks that could have gone toward the dream machine. Let time and discernment help to refine not just your collection, but the way you collect. 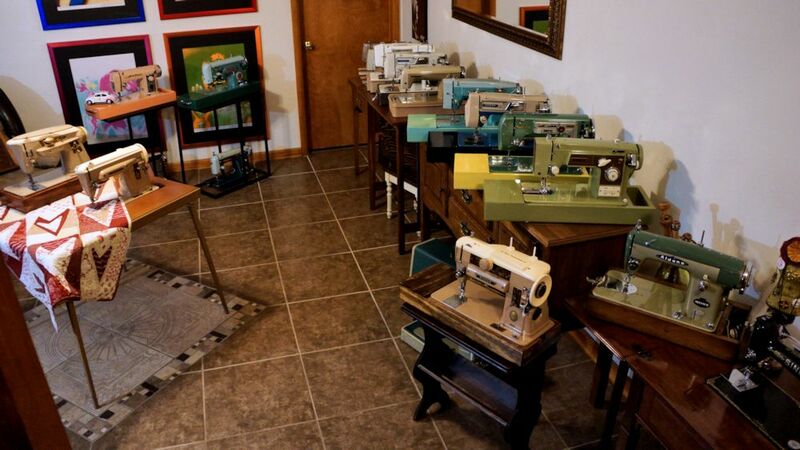 Will McCann, who appeared in our documentary film Still Stitching, has 113 machines as of February 2019. The explanation is first that I'm a sucker for saving machines from oblivion. I can’t stand to see them thrown away and I take them home. Sometimes they're just parts machines, and I’ll at least try to part them out... The other reason is just that I give them away, typically, when I finish them. Will displays his Kaiser in our documentary, Still Stitching. 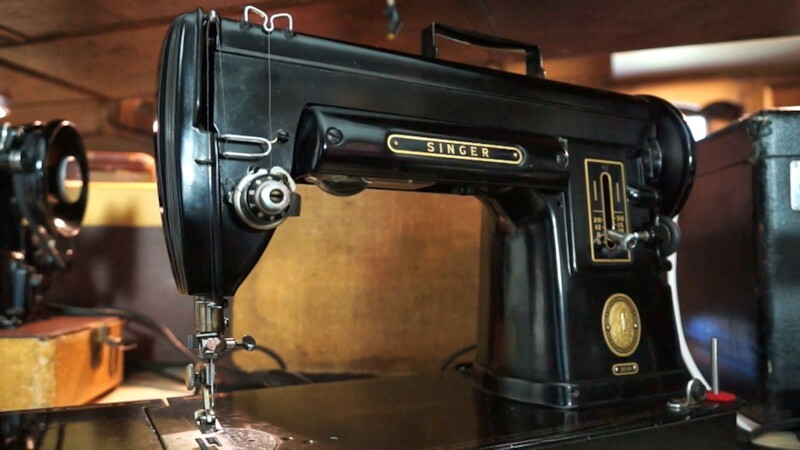 Known among friends, workmates, and acquaintances as the guy to call when someone wants rid of a old sewing machine, Will has attracted about thirty freebies. In his region, he also encounters a lot of "shabby chic" do-it-yourself'ers who repurpose cabinets and treadles but have no use for the heavy machine heads. At times, he feels he just can't accept any more machines, and he'd rather inspire the VSM spirit in others. Someone offers a machine, and Will does his best to educate them on the model, its place in history, what makes it special - all the details to inspire a new enthusiast. He has successfully recruited some newbies. However, his effort once nearly backfired. I was out picking up a barn find once. I'd driven two hours to DC to get it, and in response to the question, 'What do you do with them all?' delivered such a passionate dissertation on VSM restoration and collecting that [the seller] said, 'Well, wow, maybe I'll keep this one and try it myself!' at which point I distracted her and began packing it up and carrying it out to my car! 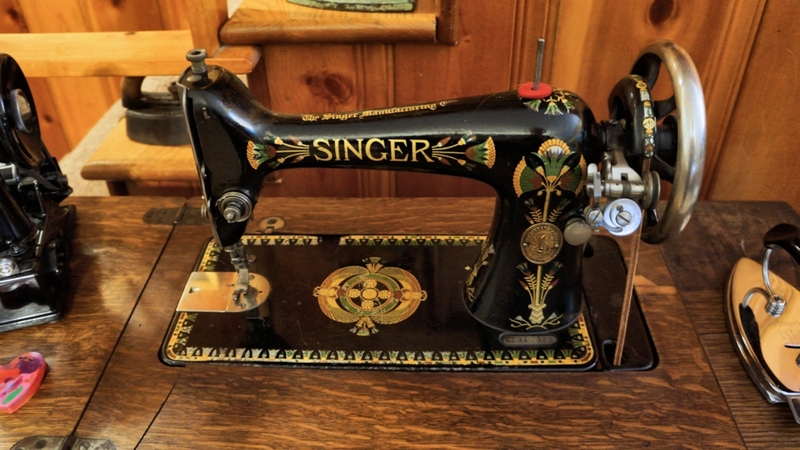 Tell everyone you know that you're on the lookout for "old sewing machines." 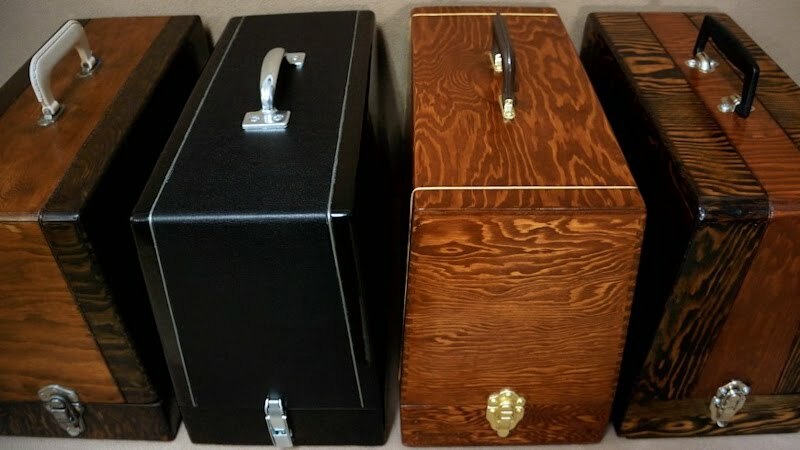 This puts you at "top of mind" for friends and family and you will get the call when someone spots that unwanted gem with the case and accessories gathering dust in someone's garage. This technique - casting a wide net - works magic over time. In our experience, close friends and family can become vested in the treasure hunt; they want to help. But again, choose machines with your purpose in mind. I don’t [presently] have a lot of room for display purposes. When the kids leave home, Kathy and I want to get a place in the country, set up a shop and display area, and spend retirement puttering with these old machines. 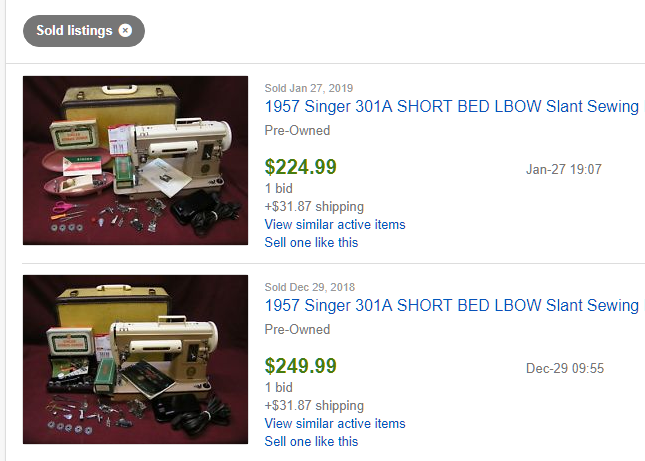 Barring time travel, no one is going to manufacture any more pre-1970 all-metal sewing machines. The flip-side is that millions and millions were made, and most aren't of significant value. Even truly antique machines, by definition a century old or more, are often abundant enough to keep prices low. The fun part is that the abundance of VSMs allows us to "pan for gold" in the wild. It's still possible to score sweetheart deals on machines that are coveted for various reasons. While the Internet has made it easy for sellers to determine an appropriate asking price, we can still run into exceptions. There are particular treasures to consider: unusual designs, lesser-known brand names (of the thousands of "badged" brands), uncommon colors, plus machines that are likely to retain their value and continue growing in popularity. When we asked experienced collectors which machines remain relatively accessible at reasonable prices, as in "recommended machines to buy," a couple essentially said in half-jest, Why would we tell everyone else and make those machines more scarce to us? Here's the thing about half jest: it's also half serious. But sharing information is an inevitability in our VSM community. Some will say that they seek these more coveted machines not for any perceived "investment value," and we believe them, but that doesn't change the fact that the following machines are indeed likely to bring incrementally higher prices in the future. Scarcity in the market doesn't necessarily mean low production quantities. Few available machines of a particular type can simply mean that they are so coveted that present owners are apt to hold onto them. Still, the effect is higher and higher prices. The aluminum "big sister" to the Featherweight is light and portable. 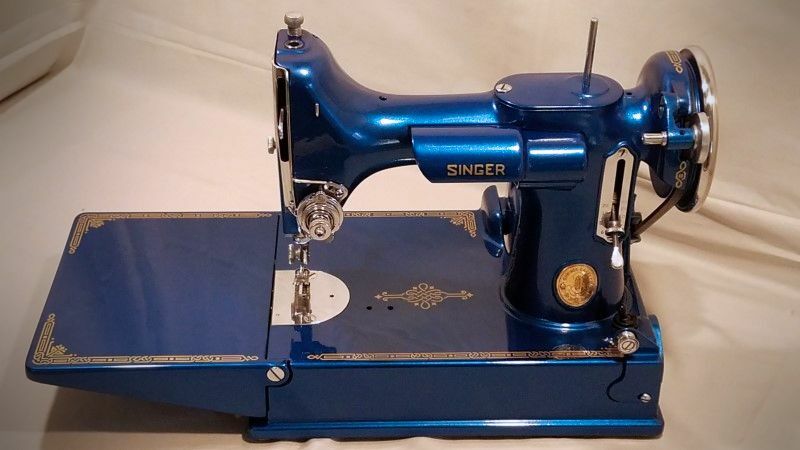 While the Singer 301A was once commonly found at bargain prices, the marketplace has figured out that she may very well be the "next big thing" on the tails of the Featherweight - especially as Featherweight prices remain stable at $400 and up. Perhaps not as "adorable" as the Featherweight, many enthusiasts indicate a preference for the 301A. The Singer 301A, an aluminum "big sister" to the 221 Featherweight. The machine itself (sans foot pedal) is 16 pounds and can be carried by an integrated handle - perfect for movement around your house or studio. However, a bag will make more sense for travel, and while the original carrying cases add a few pounds, there are light soft bags available. 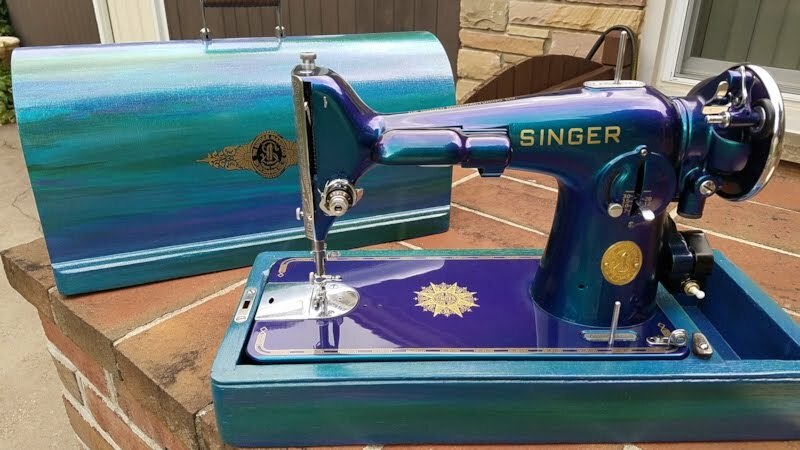 Singer really nailed it with this model - it's a full-sized, truly portable machine, released in the early 1950s when other full-sized machines were much heavier. 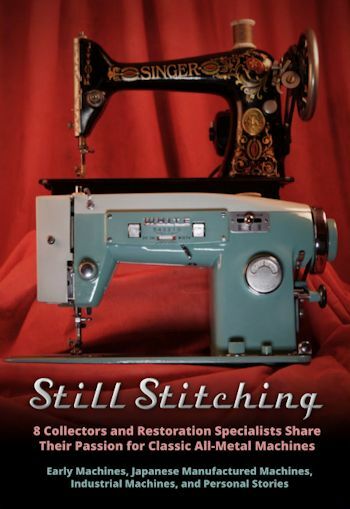 Appearing in Still Stitching, Danna L. Fore told us, "It sews better and quieter, I think, than the Featherweight does. It can handle a little more girth, you've got a little more harp space." Pointing out that the Featherweight is most suitable for light duty, Danna continues, "This I would use on, you know, jeans and actual quilting through layers." David Werther has observed that the 301 is on the rise and may become the "next Featherweight" as Singer 221s continue to be consolidated with collectors who acquire multiples. If you're interested, you should get one sooner than later as prices have climbed to $200 and higher. Find a nice one under $100, and it's a sure grab 'n run situation that can lead to profit. For those that covet a painted Featherweight, the 301 offers a perfect canvas as well. We painted this 301A for Victor Hou. 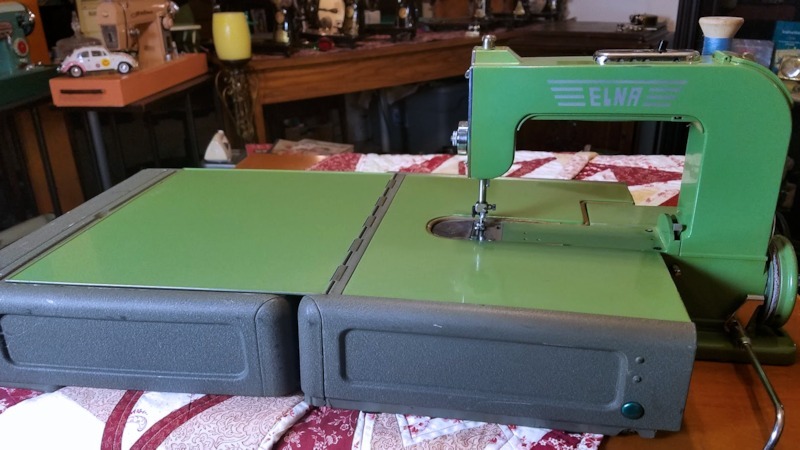 The Elna 1 has the distinction of being the world’s first household free-arm machine. Its military-finish case converts to a sewing surface. It uses a knee bar. The Grasshopper's virtues have become known to a broader population of buyers in recent years, driving up the prices. A complete package at $100 is still a great price. Anything around $50 is a "grab and dash" scenario. When speaking to experienced collectors for recommendations, a common refrain was that Necchi and Pfaff machines are not only exceptional in quality and function, they typically command higher prices. 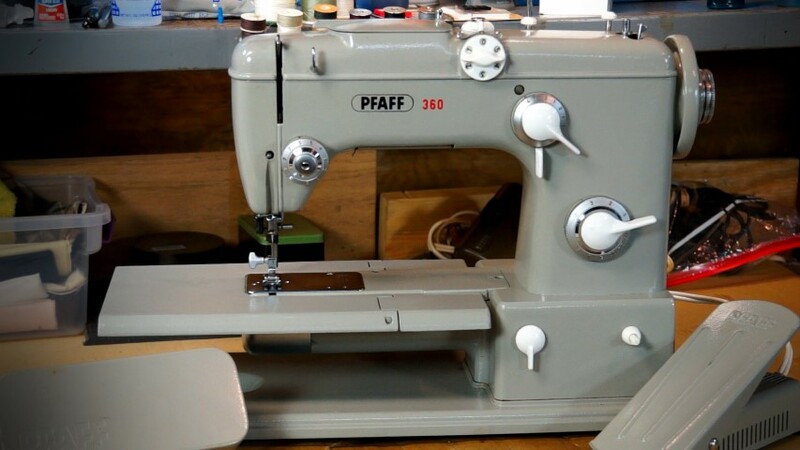 Elegant and streamlined with a convertible free arm, the Pfaff 360, trending at prices of $100 and up, is a sought-after model. Below, Scott Kennedy discusses the design and quality of vintage Necchi machines. While there are millions of the colorful Japanese-manufactured machines (usually badged with American and European brand names), there are a handful of colors that have special appeal and don't seem as abundant in the wild, but aren't impossible to grab at a bargain. Will McCann's experience tells him that yellow machines are relatively scarce. He also suggests that Kenmores are often overlooked as particularly desirable. They are generally outstanding machines and can frequently be found in sales listings at great bargains, but yellow? Not so much. We swapped this yellow Kenmore for a couple of machines with Will McCann. Less than two weeks later, we were surprised to find another! This yellow Electro Grand belongs to Karen Castor. Morse machines have a bold appearance, with buttons and knobs especially reminiscent of '50s and '60s classic cars. Their deep blue and magenta machines are coveted by many collectors. Notice the white Morse below - the brand name imprinted on the base is fairly unique for vintage Japanese machines, and a nice touch. 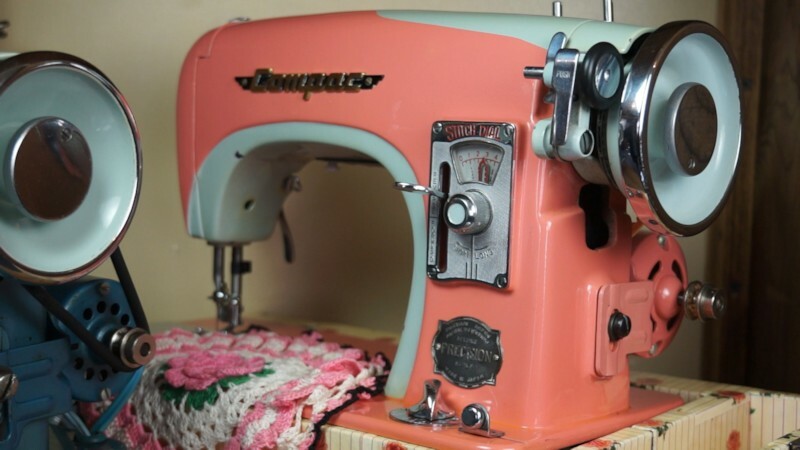 Pink machines are favorites in the VSM community and on many wish lists. When discussing pink, often collectors are referring to the range of hues including shades of pink, salmon, fuchsia, and magenta. If you can purchase one without paying a premium price, you've done well. Get one for free and you've snagged a unicorn. The salmon-colored Atlas is often mentioned in the various VSM Facebook groups. The more "pink" Brother on the right offers a unique combination with charcoal gray, a huge "chrome" panel facing the operator, and a very angular design. 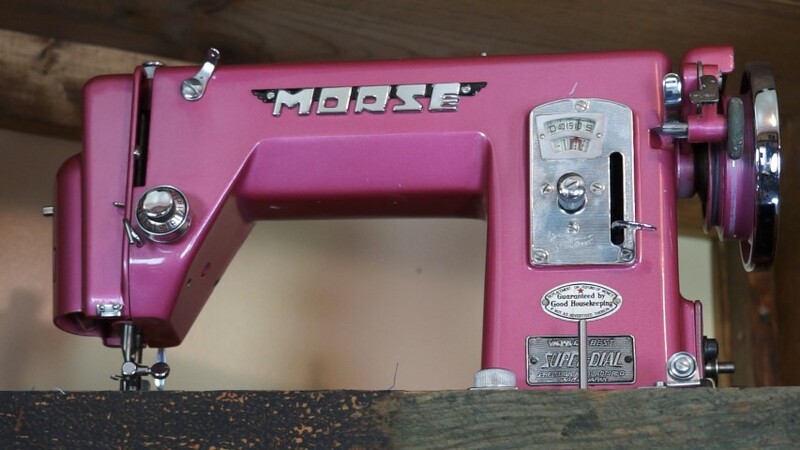 This fuchsia Morse, belonging to Karen Castor, is a coveted model. It is probably fair to say that red Japanese machines are indeed downright rare. "Scarce" is an absolute certainty. The value that the red color imbues is very different than the value attributed to models such as the Featherweight and rare antique models. The Featherweight is unique in design - truly portable and uniquely sized. Meanwhile, the value of a red Japanese machine - extremely heavy - could peak if not decline should sewing and quilting experience a lull. Its key attribute - it's "specialness" - is primarily its color, since there are millions of workhorses that were produced in Japan, likewise vibrant and capable of great stitches. 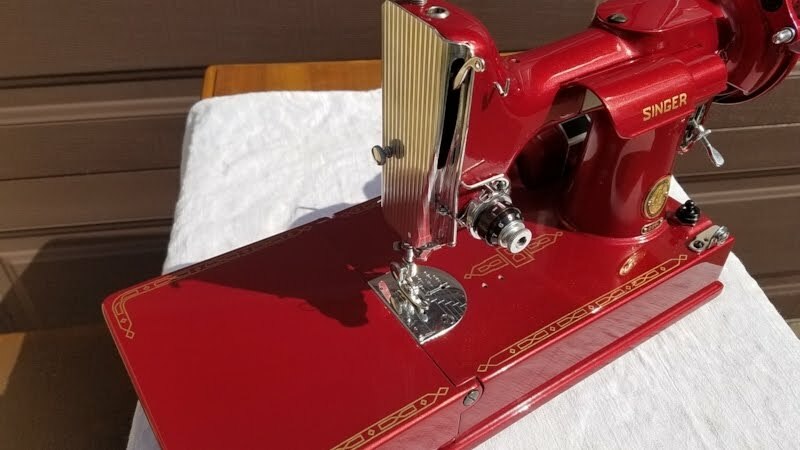 Still, here's the unique thing about the vintage sewing machine marketplace: even if the pool of collectors drops by tens of thousands, the red color will remain scarce enough that it is likely to remain forever desirable by a sub-group within the population. I had posted - begged actually - all over the Internet for this manual. Finally, a year later a lady from Canada, I believe, saw one of my posts and message me. She had the manual! I offered to pay her for a copy, but she was a sweetie and scanned it and gave it to me for free to add to our files. I asked her to join the page so everyone could thank her. It was a HUGE celebration when I posted it! 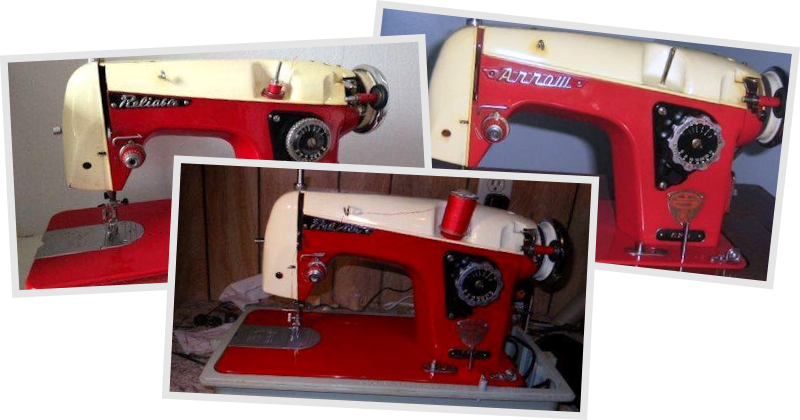 The same red machine has been badged as at least four different brands: Arrow, Sewmor, Reliable, and BelAir. The coveted red Japanese machine, most often referenced as the BelAir 620. Appearing in Still Stitching, collector Karen Castor told us, "The colored machines, to me, make a statement. They are bold, they're brilliant... they say, 'See me, here I am,' and I love that about them." She was fortunate to find the red Bel-Air online for under $100. Karen Castor showed us her colorful Japanese machines for our documentary. See the red Bel-Air's stitch regulator peeking out? Karen's Bel-Air arrived in a sad state. "They had it on the ground in front of a farm," she told us during filming. "It came in the mail, and I opened it up and I thought, yikes! It was filthy and dirty and greasy and had grass even in the base of it. I cleaned it and spent hours polishing it." Karen's Bel-Air shows no signs of grime any longer. Karen has scored another unique acquisition, a set of twins. Finding identical colorful Japanese machines indicating different brands can be a fun treasure hunt. Karen's twins, badged "Fleetwood" and "Capri," otherwise identical. 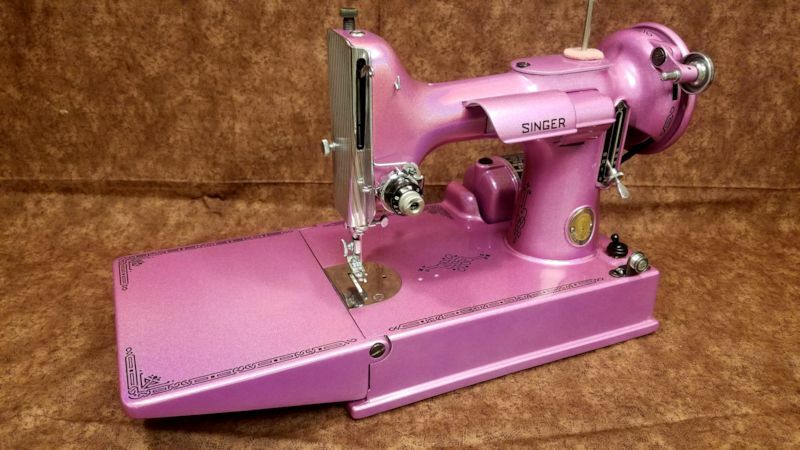 In terms of unique Japanese machines, Karen's collection includes a remarkable Compac that is both a sought-after pink hue (somewhere between salmon and peach, perhaps) with a distinctive arcing arm that creates a curving harp and throat area. To wrap up, we wouldn't dare to suggest that our tips are gospel. Ultimately, collectors will and should choose machines that give them pleasure - even if someone wants to make the drive to western Maryland to pick up our hideous historic Kenmore 95. Rather, our tips are intended as considerations, particularly for new enthusiasts. In the end, we hope you relish the hunt and enjoy a little emphasis on history as you collect. Even if you go off the deep end and find yourself with dozens and dozens of machines, we relate. Boy oh boy, do we get it. Great write-up! We have 1500+ members and several have recommended this to me. Glad I made it over here to read it. My "trick" to get past the acquisition phase is to limit my collection to pre-1900 machines and no more than one of any. (no, I do not need to have one of each VS2 Decal set thank you) I have just pushed my collection back to 1857 with the purchase of a Grover & Baker 1st model Portable. Thanks for the write up, i will be suggesting other follow me here. Thanks so much for your kind feedback, Steven. Your refined style of collecting is admirable, and your array of machines must be fantastic. 1857 - awesome! The first vintage machine I got at a yardsale for 6$ - a Necchi Lycia. While researching that, I found a whole new world (and spent 150$ getting all the attachments for my Lycia). I'm never getting rid of that Lycia; it's wonderful, and so are my VS2, 221, 301, 403, 503, Supernova, Elna2 . 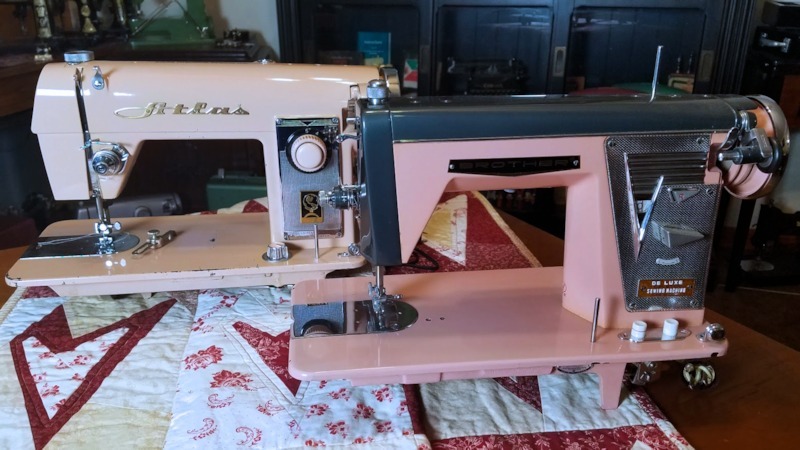 . . My husband's not interested in sewing, but he loves finding me pretty machines - he actually located and got me that 66 Lotus in a tigerwood parlor cabinet. I'm just leaving the acquisition phase - spent a while buying every 20$ vintage I found in thrift shops, and got some great keepers. But we live in a very small house and know I've got at least half a dozen to polish up and rehome; probably ought to be a little more than that. But somehow, I just keep not posting them . . .